Sampling, Chunking, Permissions and Whose Line is it anyway? We all know that is not true, but it was a great image and helps demonstrates the challenges some publisher face when asked not about the work but a fragment of it. Digitisation by its nature creates more ‘chunking’ opportunities (the selling of fragments). Do contracts fully encompass this and identify the royalty due? Are they fully tracked and reflected in all author communication? Is there really a tribe of blue rinse old ladies hidden in cupboards? The answers are varied but the issue remains the same. Digitisation is enabling sales to be made in many ways and these need now to be fully covered. Look at music and the issues sampling gave it when it first happened. Remember when ‘Billy Jean’ was sampled and Michael Jackson took the issue to court? What is the book publishing answer today to permissions in a digital world and more importantly, tomorrow? Can you believe what some may describe as the arrogance of some publishers to use digitisation as an excuse to land grab copyright? We wrote about Simon and Schuster’s latest attempt to ‘muscle’ their creative talent into new contracts, which some will say, would give them copyright until it becomes public domain. Then one day later, we read in the Bookseller that Random House Group is pursuing a similar approach. The Societies and guilds that represent authors must now raise their members’ and also the public’s awareness to the issues and potential grab that is being attempted. It is important that the reasons why it should be rejected are spelt out and not merely negotiated behind closed doors. It is not good enough for the publishers to claim the world has changed and that contracts must reflect this. No one would dispute that contracts need to be revisited, but the changes some propose are at best questionable and worst unjustified. Once contracts have been changed it is unlikely that they will be reversed. Some may say that publishers are protecting their digital investment, others that they are acting selfishly and building their assets with little commitment to sharing risk or reward. The problem is not digitisation but the urban myths and lack of full understanding around it. We are not describing a mature market, but one that despite much hype has still to take off. Where is the public debate? Where is the dialogue? Where are the facts and the economic cases? Are the agents fully educated to the bigger picture, or are they like many struggling to keep abreast of a rapidly changing environment? Hollywood writers took to the streets to fight their case, but can we expect authors and their agents stand firm against the hand that feeds them? If the PA, APA and guilds and societies do not educate and open the up the debate, we potentially face stand offs, bad press and most importantly, the reversal of contracts, lead by not the majority but a few and impacting the total industry as we know it today. One of the thorny issues that continues to hold up the full adoption of ebooks by publishers is the question of rights. Should that be a question or many questions on rights? The problem is that for an industry based on content and rights we have failed to get a grip on the core information and focused instead on the easier logistics and supply chain standards , which are still important but pale into insignificance to those of rights in the digital world. We read Jim Millit’s piece in Publishers Weekly on the Authors Guild and Simon and Schuster and wondered who is kidding who in the protracted tale of hardship, trust, contracts and abuse. On one side we have the authors who should be paid a fair price for the extension of the work into the new digital formats and on the other the continued tales of high investment and costs of digitisation and the cost of establishing the market. First, the author right to revert is a given and must never be surrendered by the author under the false statement of ‘always in print’. As we see more and more publishers trawling of the backlist, delving into past sellers and creating general quick cheap wins we recognise that the author can do that himself today and servicing the long tail is relatively cheap and easy. As they demonstrate the publisher’s commitment to a work, the physical reversion rules often make good sense. Merely listing it on print on demand services is a one off and cheap exercise. Making the work into an ebook can be equally cheap and offer POD as well. Term time licence to digital copy is probably the second best solution. However does the digital copy remain with the publisher and have to be recreated or is it surrendered at rights reversion? Reward is a lot harder as publishers have been slow to invest in content technology so face large initial investments. However, once digital workflow is achieved the incremental cost of creating an ebook is cheap, especially if the previous physically orientated processes are fully replaced. So in some respect we are talking of a set up investment and one off back list conversion. What an author should earn should be based on what revenues they can generate, the time and effort involved and obviously the cost. However, publishing is publishing and predicting winners is not easy. Making the author, in effect cross subsides the digital investment, also doesn’t make sense unless the terms also recognise that when the revenues rise they should also share the rewards. The issues that we all tend to skirt around is to do with pricing and geography. Once produced digital files are cheap to maintain, distribute and repackage. What could happen is that we see a price reduction as the market establishes itself. Will the price of the digital be set against the current in print physical format or be separate? Digital incurs tax, which tends to be absorbed in the RRP and so creates an automatic dilution of potential revenues and a new price mark. Then we have the different territorial and format prices and before we know where we are, we are all confused as to what any percentage is a percentage of. Trying to create a standard rule for society or guild of authors, may make sense to some, but it makes little sense to those, who are by their sheer creativity, are all individuals. What on earth do you want to print copies of Wikipedia for? As soon as you transfer the first page to print, its out of date. As the print is bound and the copies shipped, it becomes more out of date. By the time a customer has bought it, it is definitely out of date. Although Bertelsmann are only going to print 25,000 of the most popular pages on German Wikipedia, it makes no sense. At just under 20 euros the one volume, initial 20,000 print run is set to go on sale in September. The questions are who would buy it and why? Perhaps it’s relatively free content, with Bertelsmann reporting to be paying, one euro a copy for using the Wikipedia name in the title. Perhaps Bertelsmann get the copyright to reuse the content and avoid those 90K authors that they would have had to normally pay. Perhaps it’s just a gamble to see if customers are daft enough to pay for something that was conceived to replace what it is – abridged out of date material. Perhaps it’s approaching Frankfurt and someone dreamt up a way to get publicity at any cost. Whatever, it clearly is summer madness! We read that 7,000 vendors and retailers attended the 2008 International Christian Retail Show in Orlando last week. This is a $4.6 billion industry and one that is not holding back when it comes to technology. Zondervan launched its Symtio, in-store merchandising program. Its based on the tried and tested display of card jackets to promote the volume of titles available without the inventory and space. The Customers purchase a title by buying the card which they take home and download the book from the Symtio Web site in the format of their choice. This is the same as Go Digital’s offer of games and software in Borders in Oxford Street. They expect 300 titles to be available by later this year. An environmentally green solution, that gets customers into the store with no transportation of the books and no trees felled. However it is a single publisher solution, driver by the publisher and is exclusive today and not inclusive of others. The other interesting offer was from GoBible.com who offers a portable audio Bible device which is preloaded with the New International Version, King James or New King James version of the Bible. It provides nearly 75 hours of unabridged audio for $99.95. Some may say its just a MP3 player with a preloaded Bible but its appeal may be just that. No software, no downloads and no computer. It comes with more than 200 popular Bible stories; and a feature to search more than 31,000 verses. Just as the CBA closed we also read that The Codex Sinaiticus, which is considered the oldest known Bible will be available online in high definition images as part of the British Library digitisation programme. The Codex is a complete transcription of Christian scriptures in Greek, written by scribes around 350AD. The handwritten Greek text are the earliest surviving copy of the complete New Testament, and the earliest and best copies of many of the Jewish scriptures. More than 100 pages of the Bible will go online and include 67 from the British Library and dozens from the University of Leipzig. More delicate pages are planned to be digitised as part of a £650K project to reunite the Codex. The remainder of the Codex is still held by St Catherine’s monastery in Sinai, Egypt, where scholar Constantine Tischendorf unearthed it in 1844.The entire Codex comprises 1460 pages. We have written much on the subject of copyright and there is much more to write. The thorniest area is that which we referred to as the ‘grey area’, which lies between public domain and in print, in copyright and with full traceable ownership. To many this area of ambiguity is best left at it is – murky. To others it stops books being brought back into print and given a second chance. Establishing the rules is relatively easy establishing ownership is a lot more difficult. The American Library Association (ALA) have produced a copyright slider to make it easier for their members to understand the rules on all materials. 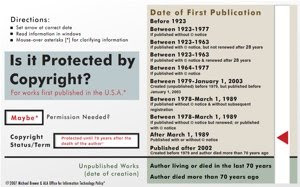 The slider shows that copyrighted works published without a copyright notice and created between 1923 and 1977 are in the public domain now. However, if published with copyright notice, they will be protected to at least 2018. However, even with a copyright notice, this only applies if they renewed after 28 years. Pretty clear there then! That is without the differences between US, UK and other countries! The slider is available online and has been created by Michael Brewer at the University of Arizona. The ALA also offers a ‘Fair Use Checklist’ that applies the four criteria of use to provide guidance to determine on ‘fair use’. Personally we found it rose as many questions as it answered, but we supposed some clarity is better than none. Copyright is the backbone of publishing and intellectual property. If the ALA have to produce guidance sheets for what are ‘professional information managers’ it begs the question of how authors and consumers have any idea what is public, what is fair use and the rules. As we enter an era where controls are passing from professional and institutions to anybody we have to question whether the rules can be either simplified or tracing copyright can become easier? Why haven’t we got an effective copyright clearance centre? Why isn’t copyright clearly accessible on all digital materials? How do we find about rights reversals, permissions and other issues if the basics are so ambitious? Scan first ask later maybe is an understandable route for some! SellStudentBooks.com is one of those ventures that is simple and hits you like a brick when you see it. Set up as a student social network site it did what it said on the tin and sold students books. These were used text books and obviously were a hit. They also recognised that students had other needs, dating, meeting other students, accommodation and used laptops . The result is a first class example of what a social network site should be about – a community and their basic interests. Its ironic that this week SellStudentBooks.com extended their reach with selling ebooks. Not downloads but online subscriptions. After all they can better meet the student’s needs and that’s what SSB is all about. Available via sellStudentBooks.com and SellStudentStuff.com the offer shows enterprise and flair. The have even gone one step further in teaching others the basics in that they don’t store the files merely handle the transactions and the student interface. Today they have some 20,000 Taylor and Francis titles available to their audience via Digital Drop Ship. At a time when misconceived social book sites stumble these guys are certainly remaining focused and demonstrating what social networks and commerce are about. It appears that size, contrary to everything people say, does matter, or so Amazon believe. As a result, it is reported in Wired that a new Kindle will soon be with us measuring 8 1/2 by 11 inches, like a sheet of letter-sized paper. What would be obviously more appealing than the extra inches would be colour, a fully functional web browser, but then we would have a laptop! Why increase the size of the screen to compete with devices that we all have, use and that cost only a little more than this one dimensional tablet? Is the ebook reader we know today doomed? Today they don’t add that something, so special, they are a must have one. Neither do that present a cool style icon, that makes them a ‘must to be seen with’. Lets be honest the Kindle took three years to develop and the design says it all. The Sony forgot the interaction, gave us a screen, a carrying case and an umbilical cord back to the PC and the iLiad tried but got the economics, the look and marketing all wrong. We have seen the buzz about the iPhone and the copycat races between all the mobile devices all trying to catch up or surpass it in looks and functionality. It is clear that applications and functionality is going mobile. It is clear that in the world of labels, design matters. It is clear that Apple got it right. We now brace ourselves for the ‘ebook event’ of the year – the worst kept secret ‘Septemberfest’. What do we expect? There is bound to be plenty of press coverage - after all Amazon and Sony can deliver that. There is bound to be many who want the latest gizmo – after all someone had to buy the Sinclair C5. There is bound to be those who want to stand out at the airport or think that they look cool with it in public – after all Michael Douglas ran up a beach on film carrying a brick (early mobile phone). There are bound to be smart statements claiming phenomenal sales, but if like last time, probably lacking real numbers. The issues that will determine success are availability of the right content, ease of use, functionality, interoperability, price and the feeling that it’s got some life expectancy. We haven’t found one today that we would want to spend more than $50 to $100 on and treat as a gimmick, or as a potential throw away. Also we would want to know that what content we buy also has some future and isn’t tethered to a short life product and can be transferred to whatever as many times as needed into the future. We are not negative towards digital content or ebooks and are fully behind them we are just very cautious about placing a bet on a horse that is obviously lame before the race has started. The tour kicks off on August 10th in Central Park with The New York Public Library and other events are scheduled in the following days at Queens Borough Public Library and Brooklyn Public Library. The tour will travel across the USA in 2009 and a full schedule is available at www.digitalbookmobile.com. The Digital Bookmobile is hosted by individual libraries in support of their download services and operated by OverDrive inside its 74 foot, 18 wheel tractor-trailer. The community outreach vehicle is a great idea and certainly could create an engaging experience around the individual library’s digital media collections. The exercise should bring several questions to the table. Are the downloads are free under the public lending rights? Will access be restricted to only local residents? Why should a consumer buy a digital copy when they can rent it for free? Will borrowers be able to download from anywhere for free once they are registered? Is the inventory on offer truly local or is it a library offer from Overdrive and therefore a free white label offer? The relationship between libraries and bookstores in the digital environment is far more sensitive than in the physical world. Here copies and access were limited and the borrower had to visit the library to both lend and return. In a digital world they merely may just log on, download, consume and it automatically deletes itself at the end of the term. How do bookstore compete with that offer? The tour is a great idea and the digital outreach a real smart idea but what is the consequenses if it canabalises bookstores sales. Overdrive still get paid, libraries still pay, publishers still achieve library sales, the consumer get content for free but what is the impact on author’s royalties and on the bookstores and campus stores? Amazon has announced Amazon Video on Demand which will be available to a limited number of Amazon.com customers this week and widely available later this summer. The new store will show some 40,000 movies and television programs, but unlike the original Amazon’s video store, will delivery these via a streaming Internet service not as downloads. Amazon Unbox, the company’s original download-only video store required customers to download special software to watch the programs they bought and only worked on Windows PCs and TiVo set-top boxes. Amazon has struck a deal with Sony to place its new Internet video store on the Sony Bravia line of high-definition TVs, making the new service available through Sony’s Internet Video link. Amazon now plans to pursue similar deals with other makers of TVs and Internet devices. With the exception of Walt Disney and ABC, films and TV shows from almost all the major studios and television networks are available for sale or rental to Amazon’s customers in the United States. Amazon Video on Demand will have formidable rivals with Apple, Netflix, Microsoft and Google all want to dominate the emerging world of digital video. 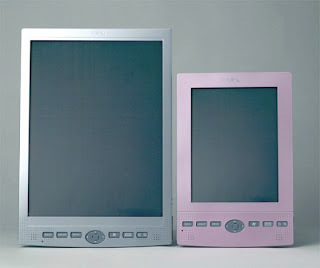 Fujitsu's FLEPia e-book Colour reader is rumored to be close to launch. The A4-sized readers don't have an integrated backlight, but reportedly run for up to 50 hours on a single charge and are WiFi-capable. The cost still appears too high and rumoured to be $941. Again the keyboard appears to be dropped so its obviously not aimed at the academic and educational markets. Like others it appears to some to have missed a trick. It’s a sad day when we see the trade magazine Publishing News announce its closure. Fred Newman was one of the first to sit down with me and talk through the industry and its issues. He not only listened but also gave me column inches. The paper was the Nibbies and the Nibbies was Publishing News and it was apt that Fred made it to this year’s event. Many will speculate where the paper went wrong and applaud what it did right. I personally will be very grateful for the time and the coverage it gave me and others in the industry that weren’t always from the majors. It supported the Publishing in the 21st Century Series in the late 90s and it was the first to applaud the Brave New World report and support its findings. It is often interesting to find several different angles of an issue being raised. Yesterday we read in the Times the story about literary agents and that any literary agent now needs authors with form: preferably famous, prolific and also deceased within the past 70 years. Literary estates are now seen by some as ‘safe bets’. Often they have been neglected, they often have or it is relatively easy have their rights reverted and often areas such as foreign rights have not been fully exploited. We referred to this area as often being the ‘grey area’ and somewhere between the ‘white’ that is public domain works, (pre 1920) and ‘black’ in copyright, in print and well recorded and with a living vested interest – the author. The digital world now throws up many opportunities to bring back previously successful works, or even those that failed first time, but ones that may now deserve a second chance. However it is not just literary agents that have seen this opportunity. Publishers are increasingly dusting down their back list and discovering titles which are relatively cheap to bring back. Others are scouring the libraries and second hand shops for gems. Some titles will be dusted down, given a new jacket, maybe a new title and even re-typeset and then brought back as front list. Others may be scanned and converted to print on demand or digital only formats. There have always been packagers and reprint houses, but today many have now joined their ranks. Also ‘classics’ which were once said to have had their day, are currently enjoying a new one and being extended into new genre. Today we also read that Barnes & Noble plans to expand its rare book department into a larger one in Broadway and to a more prominent position within the store. They have long sold bargain books and printed packaged editions. Today the Bookseller also reported that Google has signed up France's second largest library, the municipal library of Lyon as part of Google's Book Search Library project. It will give internet users full text access to public domain works, through Google Book Search. Lyon will join 29 other libraries such as, Oxford University, Harvard University, Stanford University and Princeton University in the project. Some could be said to be merely scanning anything that has moved. So the market is awakening to the vast volume of titles available and starting to create a comprehensive offer of all, to all. The ‘grey area’ is an obvious area for a potential land grab, as many titles have a poor if no rights ownership records and these ‘orphans’ can now be adopted relatively easily. However, what does all this mean with respect to what is sold, to whom, in what form and by whom. Can estates and authors make sure that their copyright is not adopted without permissions? How do you establish what is public domain? Who owns the digital rights to old titles? How does Google intend to monetise its investment in the long run? Does print on demand mean ‘always in print’? There are many more questions and many can be simply answered by those better qualified to answer than ourselves. However, we are now clearly entering into a new exciting ‘long tail’ phase, where anything ever published will be potentially available for all. But what controls are needed, do they exist today and who will and can it be policed? On Monday eBay won a US court battle with Tiffany that there were not liable for the sale of counterfeit jewellery on their site. This wasn’t a quick decision as the case had lasted 4years but it could be a significant one re the eBay service and those offered by similar sites. Judge Richard Sullivan ruling, in Federal court in the Southern district of New York said that under current law Ebay should not be held liable, and it was up to lawmakers to decide if trademark owners were adequately protected. Earlier this year a similar case brought by LVMH against eBay had gone the other way, so the issue remains somewhat open. Judge Sullivan said, Ebay’s efforts to prevent sales of fakes, including removing listings promptly when warned that the items were counterfeit, showed that it took adequate steps, and it was up to companies like Tiffany to police their own trademarks. The ruling raises the question of how companies who aren’t as big as Tiffany ensure that their trademarks aren’t being violated. However, when we step back into the physical world that is exactly how it works and the onus is always on the holder to pursue the infringement, there are no parent police as such. The internet merely makes it easier to copy and easier to trace. The second article reported that Brussels is expected to push ahead with reforms to extend copyright protection for performing artists from 50 to 95 for European singers and musicians. This move would move Europe into line with the US, and be applicable to all from rock stars to session musicians. The Commission’s antitrust arm is also looking at “collecting societies” who collect and distribute music royalties. It is expected that societies are likely to see their domestic monopolies over broadcast material broken down. One objective would be to enable any collecting society to deal with the rights to use a piece of music across Europe. Copyright continues, and rightly so, to be a major area of focus for all especially in the media sector. As the digital world expands, so do the opportunities and challenges of maintaining and protecting copyright within it. I was honoured to be invited to speak in Minneapolis at the National Association of College Stores (NACS) Innovate 2008 conference. The focus was about how the members could gain competitive advantage through technology. Campus stores are being squeezed by many and also face lots of new digital challenges. How do they engage with their community? Are student customers for life or just for a short time and why can’t they retain the customers past student life? What do their customers want? What is the size of their market and their percentage of this? Once they have established where they are they have to decide where the want to be and how they get there. It is not about digitisation nor is it about technology – it’s about retail. The campus store is not dead it is merely changing and adapting to new opportunities. Will it survive – I believe so but it will be different and will be built on its existing relationships with its community and its publishers. 1. Adopt Digital Drop Ship as the model to engage all bookstores into an effective channel for all publishers. Some would argue that the aggregators do this today but look at the exclusive models and demand more. You need an inclusive, integrated and independent model that is inclusive not exclusive and builds on the relationships you have today not one that merely put someone else between you and your supply. 3. E Inspection copies. I believe you are integral to the process today and going forward. If you aren’t plugged into the process, where will the sales go? Only by working collectively and with others will the real benefits on offer here be realised. After all the reviewers are your customers, the students are your customers and the books are what you should be selling, so why wouldn’t you work with others to secure it? 4. Print on demand offers much but is a significant change. It may work in one store but not in another today. However if you became the first movers and viewed it as a local resource could it secure a bigger market. If you wait someone will do it first. That may be a competitor, a print shop, a library, even a coffee shop. What being a follower mean to your business and community relationships. 5. 508 is my last suggestion. This is not an individual store option today as much as a co-operative one which could provide high visibility, take away a painful exercise for publishers, provide a real service and relationship link to the thousands of disability officers and the solution is not difficult not expensive. Last week we went to see Crosby Stills and Nash in Minneapolis. The Orpheum Theatre was full, even if the audience was all over 50 and the gig was good and the merchandise stall was heaving. Tonight it’s Mark Knofler that is sold out. At the Basilica Block a few blocks away, some twelve bands will be performing top a packed audience and the story goes on. This coincides with reading in the New York Times that US concert tours from January to June grossed $1.05 billion Bon Jovi topping the list grossing $56.3 million, followed by Bruce Springsteen with $40.8 million, and Van Halen, with $36.8 million. Madonna, who signed a $120 million contract last year with Live Nation, and Coldplay both have forthcoming US tours which are almost sold out. We have all seen the explosion of rock festivals this summer and if we couple this and the general healthy state of performing music with the increasing success and interest in literary festivals and events we start to see a continued growth in the demand for that ‘live’ experience. So despite the credit crunch and fuel costs, tours continue to flourish. However there are signs that times might be getting tighter with a drops in overall ticket sales. Despite the tight margins within the business up to 90% of the ticket income goes to the artists. Unfortunately, the literary model doesn’t work the same as the music one and the experience is not always as fulfilling. A good writer is not always a good performer and the personal contact on the signing ‘conveyer belt’ is often brief. The TV couch review and interview can again appear dry and un-engaging as a format. Author videos can also appear distant and some would say often rambling affairs. The ‘longpen’ signings are and aim to be remote. So there remains two challenges – how do the trade exploit the ‘live’ event to engage new readers ? And how do authors exploit the ‘live’ event to increase earnings? Authors are to words what music is to musicians and music is in itself a live experience. So why not focus on the author’s strength – their words? How do you make this ‘live’ engaging and a one to one experience? The answer is certainly not a ‘bobbing head’ video. Years I remember reading Tom Peters daily words on his site http://www.tompeters.com. Again look at Scott Adams Dibert web site http://www.dilbert.com/. These are perfect examples of an authors web site and how they can create that direct experience with their readers. The question is whether the author, the publisher or the fan base creates the site? How often the author updates it and how effectively it communicates to their audience. There are many bad examples of what some may refer to as cut and paste formula web sites that are cold and frankly don’t do the author justice. Merely listing the books with some little extra bits is no different to Amazon! When Apple opens its store on Friday and Steve Jobs launches the new iPhone, the impact is likely to be as significant at last time, but the difference this time, is that its not so much the phone, but what you can do with it. The new 3G phone has been effectively unlocked to enable more than 500 developers to create new applications and download others. The technology market has harnessed applications to drive demand before. Remember the IBM PC powered by Microsoft Window and more applications than the Mac. Remember the IBM and HP and DEC mid range periods of dominance all driven by software applications. The availability of rich software could help tip the market further towards iPhone. However the gulf they have to breach is not small with Palming claim to have some 30,000 active software developers and Microsoft more than 18,000 applications available for its Windows Mobile operating system. 25% of the initial Apple applications will be free and 33% will be games. 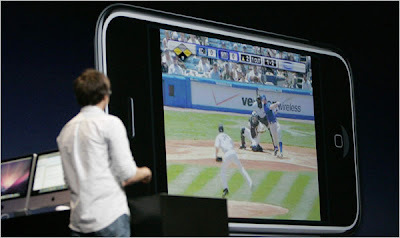 Of the commercial applications some 90% will be sold for $9.99. Apple would provide distribution and marketing. Many have said that if Apple were to create an ebook reader then the market would take off. Others have agreed that the content and it packaging would need to change also to fit the mobile demands. What is clear is that the mobile applications market is hoting and opening up and it may not be Apple who now has to create that magic connection. Interestingly it is not rocket science to understand that the reason that Adobe back the epub standard so heavily and developed the only DRM to support it today was to have re-flow text that can be rendered on the mobile platform. Perhaps things a closer than we all imagine. Reuters reports that Google yesterday launched, ‘Lively’, a ‘three-dimensional virtual experience website’ to match the virtual world Linden Lab's Second Life. So we face more avatars, three-dimensional graphics and virtual rooms. Lively plays YouTube videos in virtual TVs and displays photos in virtual picture frames inside the rooms. It’s certainly new with little there today but Google obviously see the potential and the trick will be using the Google brand to leverage the footfall. Who knows we may well soon see another animated signing from the publisher Snowbooks but this time in Lively. Richard Charkin's blog used to give us those fasinating insights into his travels as he wrote about publishing change. We don't have his same talent, nor is this hotel room in chicago at some jet lagged hour, the same insights, but were spurred into reviewing the news and writing this piece. Monday’s piece in PC Pro should be a wake up call for those in charge. It cites author Nick Hornby’s stinging attack on eBook readers. He rightly ridicules the cost of the readers, their functionality, the excessive storage, lack of ebooks and the fact that the current readers are as trendy as those early mobile phones that resembled bricks. We don’t think that he says anything new and any reader to these pages will be aware that it is what we have been long saying. So why do we still pump up the volume and appear to be walking blindfold into the Kindle versus Sony versus Iliad debate and that every nearing September ebookfest? We have to understand that digitisation is not about ebooks, audio downloads, online, podcasts, blogs, widgets etc. these are merely the delivery and marketing formats. It is about the creation, development and distribution of content, the development and distribution of the contextual information that supports and helps qualify content and rights that are acquired, developed, produced, marketed, sold and read. It is also about the changing roles and relationships right across the life cycle from Author to Reader. Unlike music a book is already the content, the format and a reader. Books will be the major format for many years and represent the major sales revenue for all. However there are two issues. Firstly, the book has joined together a number of different sectors into one. As we digitize then these differences will become more distinct and the various sectors will diverge often in different directions and at different speeds. Secondly, we all love and are comfortable with books. Authors love to write them, editors love to edit them and readers love to read them. We have been educated with them and have grown up with them. So where’s the money and why do authors, publishers, retailers, libraries and consumers need to engage? Digitization now creates the opportunity to explode the spine of what we have known for the last few centuries and present content differently. Will it replace the book? No. Will it help redefine it and how we develop and sell it – most definitely? Will the digital book be the same as the physical one? I hope not otherwise we will have fallen into the same trap as we did between the hardback and the paperback. Our point is that unless we start to look at the digital opportunities as a whole and right across the life cycle, we will continue to restrict yourselves to merely converting finished books to digital renditions and wonder why consumers still want books. Digitisation offers the bold the ability to focus on content and rights and be flexible in order to adapt and maximise the revenues from them. When the rights remain and content is locked in yesterday then the opportunities also remain locked. This is fine as long as someone doesn’t do something different. We recently spoke with the head of one of the ebook reader developers who said that he wanted to seize the huge opportunities in education and academia. We asked him if his device was capable of annotations, bookmarks, holding applications and data, was wireless and met the needs of the student? Some ebook reader developers will be pleased with those questions but they will have their own challenges. Some would say that most have technology solutions looking for a problem. Nothing new there then! All today have the price challenge. When we focus on one aspect of the overall picture we often get blindsided, or end up asking what happened when the likes of Microsoft close Live Book Search. This fuelling of the ebook reader as the solution the silver bullet and the ultimate consumer need is naive and leaves the market open to rebuffs from such as Nick Hornby and begs the question on what we learnt from the heady CDRom days? The Glass is Half Full not Half Empty!! Today we read the fruits of ‘Digitise or Die’ in the Bookseller’s report of their conference. One speaker was the author Andrew Keen who was reported saying that ‘The content business is in crisis’ and needs to fight back against the ‘tyranny’ of free content. However his argument that the potential change of business model in music and newspapers towards advertisement paid consumption is far from logical and shows a questionable grasp of both history and fact. The recorded music sector is moving towards alignment with advertising, but because its free at consumption doesn’t mean its free. Nor is it the reason behind the chaos in this music sector. Where there is genuine free content, that is down to file sharing and nothing to do whatsoever with advertising. It also worth noting that music is enjoying good times in performance, merchandising and publishing. The newspaper business has always had a business model heavily skewed towards advertising. Again the changes that are happening here are both complex and challenging. Newsprint is one sector and is different to magazines, serials and business information and to infer they are all the same may be seen by some as naive. Keen, whose book was called, 'The Cult of the Amateur' is reported as saying that "When you take away the gatekeepers everything becomes crap. Writers don't get rich and famous on their own." He recognises the need to develop talent brand and holistic author offer'. We are clearly seeing a shift in business models but today no commercial publisher, rights owner or model are based on totally free content. Today is not about Digitise or Die but about understanding and managing digital integration and change. When you look at the current roles within the publishing life cycle. Simplistically, we see the Author as the content / rights creator, the publisher as the content / rights Manger, the retailers and libraries as the content / rights portals and the readers as the content / rights consumers. We now have to understand how creators get rewarded in a world where the book is just one part of the commercial jigsaw. What does it mean to manage content and how is it different from managing ‘books’. What does it means to be a portal and is that different from a bookshop or library. Finally, what does the consumer value and how does that convert into revenue. Can you determine who someone is and where reside by their computer IP address? In the interesting and ground breaking Google versus Viacom, Google have argued that YouTube viewing data should be kept from Viacom, to protect the privacy of its users. However Google in the past has also rejected demands by privacy groups for more protection of I.P. address records, claiming that in most cases the addresses cannot be used to identify users. So that pretty unclear then! A federal judge has ordered Google to give Viacom its records of which users watched which videos on YouTube as Viacom press it’s $1 billion copyright suit against Google. The judge requires Google to hand over to Viacom the login name of every user who had watched it, and their IP computer address. The data covered by the order includes every video watched on YouTube since its founding in 2005. In April this year, 82 million watched 4.1 billion clips some say virtually every Internet user has visited YouTube at some time. So we have on one hand the handing over of personal access information, on the other we must ask about the about of information the likes of Google has in its vaults. Viacom claim that YouTube’s success was built on the popularity of copyrighted clips that were illegally posted to the site and that the data will validate that but the user rights issues and data issues this case raises go far greater than the case itself. We now read that from a different legal angle EMI has filed a federal suit against VideoEgg and its partner site Hi5, alleging that they are responsible for the EMI-controlled music videos that they display. ISPs are generally not liable for the content passing through their networks, but the question now is whether the new social networks and sites like YouTube are in the same legal position. Viacom and EMI say they're not. They argue that both YouTube and VideoEgg knew about the material abuse VideoEgg claims to have "humans review every video." Meanwhile ISP Virgin Media has begun sending out 800 letters to users who have allegedly been using their connections for file sharing purposes. The campaign is in partnership with the British Phonographic Industry(BPI). BPI has been reported as saying that "thousands more" would be sent in the near future. The envelopes state, "Important: If you don't read this, your broadband could be disconnected." However, Virgin have stated to BBC Newsbeat that there was "absolutely no possibility" of legal action being taken against users as part of the current campaign, and that it wouldn't hand over user information "under any circumstances." A mixed message there then! In 1998, US Congress passed the On-Line Copyright Infringement Liability Limitation Act (OCILLA). Codified as 512 Digital Millennium Copyright Act (DMCA), the law shelters on-line service providers that meet the defined ‘safe harbour’ provisions from claims of copyright infringement made against them that result from the conduct of their customers. These ‘safe harbour’ provisions are designed to shelter service providers from the infringing activities of their customers. So what is a ‘safe harbour’ and who will define the rules? Copyright infringement is a serious issue but so is personal privacy. We await more litigation and hope that common sense will prevail. We remember when we first saw Woody Allen on black and white TV in the late sixties and the story he told about when he had an overdue library book. He was quietly sitting at home when the house was suddenly surrounded by armed police, searchlights blazing into the windows, megaphone messages to give himself up, helicopters hovering overhead. They demanded back the book. He had to walk out, hands in the air, kicking the book in front of him and as a punishment they took away his reading glasses for a year. It was one of the funny stories that was as much about, how he conveyed the story, as the story itself. So it was funny to read in the Telegraph that private detectives are being use by Norfolk County Council to track down unpaid fines for overdue library books and school transport. Only about 10% of the cost was related to recovering overdue library books, DVDs and CDs. It once again conjured up those images Woody so masterfully created but this time one could imagine surveillance teams parked outside the house in white vans, phones being tapped, databases being searched and the boys being sent round with baseball bats. It is reported that library users in Norfolk alone have over the last six years paid £1.4m in fines for overdue books. Then there are the books that never return to be often found later in car boot sales or auction sites. We probably have all seen used books with library stamps and determining the genuine from the stolen is impossible. Digitisation may help in loss prevention and debt collection but itself raises many issues about libraries versus retail, free to read versus pay to read. Until these and other issues are addressed then it looks like we now have to beware of strangers in trilbies and raincoats. For those who can remember there was a time in the late 90’s when the world of rights clearance and permissions tracking and clearance came close. The likes of Subrights.com, rightscenter.com and Yankee Book Pedler were all pushing the envelope based on Internet services. Then came the reality of the size of the issues faced, the lack and consistency of the base information within the industry, the bursting of the dotcom bubble and the economics of start ups breaking new ground. It is interesting to think what they each set out to achieve and wonder what would have happened if they had succeeded? Subrights.com was probably making the smallest leap but if my memory serves me well went first. They basically wanted to trade subsidiary rights on line cheap and cheerful. A rights trading market offering buyers and sellers a place to trade. Rightscenter were a bit more ambitious and with Silicon Valley backing wanted to create a global rights trading clearance house. The issue wasn’t the system as this was slick but about capturing the information efficiently and it soon got sidetracked into the Asian market opportunities. Some may say it lost its focus. Yankee was driven to address that old thorny issue of permissions. They wanted to do this online, first capturing the publisher’s expression and associated value and then resolving requests and taking the money. Unfortunately permissions were often a mystery to most and one old colleague once described it as being managed behind closed doors with little logic and few questions asked. The champion went off to Hewlett Packard and Yankee went in another direction. I may have had selected memory on the above and missed some points or even got some wrong but that is not the point. So why is all this relevant today? We still don’t have a rights clearing centre that can capture and resolve rights queries or trade rights and as more content goes online and is digitised the need to identify who owns it and what rights are associated with it becomes more important. Where do you start and what is the natural development path? Are rights and their trading separate to the content or inherently linked to it? Should you be able to click on any object and see an expression of its ownership and attributes? Alternatively should there just be a clearing house that stores all information and allows search and discovery? Should the ownership be with the industry fairs as that is the trading forum for much of this activity? Should be the driver be the bibliographic houses who some would argue are the obvious aggregators? Is rights trading purely a B2B activity? It is interesting that a business that is primarily about rights and the trading of rights, appears not to have agreed a road map of how to address and approach this in this global and digital environment. The Chronicle of Higher Education reports on the increasing number of college students that are downloading illegal copies of textbooks using the same file-trading technologies used to download other media. Textbook Torrents, is one of the sites being used and is reported as promising, ‘more than 5,000 textbooks for download in PDF format, complete with the original textbook layout and full-color illustrations.’ They even incite students to start scanning their textbooks, "Scan as many of your other textbooks as you can, and put them up here for others to benefit from. There aren't very many scanned texts out there, so let's change that." Also on the site's forums users often list the books they would like to see uploaded. Scribd, a document-sharing Web site that opened this year is also mentioned. Scribd promises to remove any content that is uploaded without the copyright holder's permission and banning users that repeatedly abuse that rule. So far, publishers have largely acted on an ad hoc basis and targeted the sites making the material available, rather than the students themselves. What we are seeing is de javu. We saw the same in music with the early Napster and Kazza services and although they were different, the drive was the same. If the content isn’t available someone will make it available. If you overprice or value it someone will do it cheaper. If you lock it up and restrict access and usage, someone will free it. Today Academic text is were the most digital content and activity is and it interesting that the problems are now starting to be very visible in this sector. What does this say of the other publishing sectors, particularly Trade? Scanning a book isn’t a simple task and takes time and effort but when the content isn’t there in the format required, some people will do it themselves, and then they will share it. The current dearth of trade digital content has to be addressed and the existing channels fully supported. We also can't expect consumers to always understand and respect territorial restrictions in a global digital environment. We can’t expect consumers to buy ereaders in the current content vacuum, as the potential consequences may be bigger than the investments that some are apprehensive about today. Starbucks will close 600 stores and cut 12,000 jobs across the US. The closures will equate to close to 10% of its US operation and that is not a small number to cull. This follows on an announcement last week that they were to also reduce their in-store music offer down to just 4 CDs. Perhaps, it’s the downturn in the economy. Perhaps, the streets and coffee market is getting over populated with coffee offers. Perhaps, its just time to draw breath, consolidate and to focus. The sobering thing this says is that growth is not boundless and that even highly successful brands and market leaders have a bad day and have to focus. Many have seen the in-store coffee franchise as a bookstore crowd puller, but when credit squeezes everyone is chasing the same pound and the same customer. Print on demand has enabled self publishing services to flourish and Warhol’s 15 minutes of fame now beckons all. There is nothing wrong with wanting to tell that story that is apparently lurking in each of us and although some may question the content, we can’t deny the huge desire of many to be published. However, as with all publishing there is the writing, the editorial development and production, sales and marketing and the task of selling the book. Today, a good old favourite ‘The Oldie Review of Books’ literally fell into our hands and long may it do so. Having quickly scanned through the reviews, we got to the classifieds and were ‘hit’ by a full page advert for Book-Promotion.com. An interesting promotional company that offers; a professional created review, press release to 14,000 magazines and newspapers, your own author website consisting of 7 pages and that is yours forever, search engine optimization, your book guaranteed top position in book comparison sites, your book advertised in Google Adwords and Adsense, Your book on ten social sites (visible to 500 million people), postcards and display posters. They guaranteed 5,000 unique visitors to your web site and 3 months one to one advice. All this for three payments of £132 totalling £396! Well as usual we couldn’t resist a visit to a site that offers so much. Let’s step back and look at the math. As a self publisher the book will cost an author say £4 a unit. Therefore to recoup the book promotional costs the author must sell at least 100 copies at £8. Then there are the other charges that must be born in dispatch, commission costs or discount deals associated with Internet retail. Before you know it, the unit cost creeps upwards, or the volume to be sold has to rise. Vanity publishing is often just that - vanity. Some vanity houses are good, some aren’t worth the effort, but irrespective the author pays. But beyond Vanity there are self-publishing, book-packaging and many do-it-yourself options all of which offer many gifted writers the chance to do it themselves. It may be a title whose rights have been reverted and in which the author still has faith. It may be a local book which can find a lcal market or a specialist book that again has a market. However how do self publishers determine the sharks from the rest? Not unlike publishing itself it’s a gamble. Interestingly we read last week’s Bookseller and found on page 41 the Book-promotion.com advert. The interesting point was that the price was not £396 but £496. Maybe they need a proof reader or inflation is really soring!! !